Silver or gold? It’s an age-old quandary. You don’t have to choose between the two anymore with the sporty but stylish TAG Heuer Women’s Aquaracer Two Toned Diamond Watch WAF1425.BB0825. If you enjoy both the cool gleam of silver and gold’s warm glow, TAG Heuer designed this stainless steel, plated gold, and diamond watch for you. This timepiece is anything but plain. The striking contrast of steel and gold forces your attention from the dial’s golden hands to the gold links running through the silver bracelet. Round diamonds in gold settings glisten at each hour, with the exception of 12 o’clock, where numerals stand, and 3 o’clock, where a date window appears. A white mother of pearl dial holds its own against the amber luster of circular bezel. This watch’s arresting quality comes from the sudden deviations that both please and awaken the senses. The stark contrast in material makes this watch more unique than elegant, but the luxury of the piece remains uncontested. Admiring this watch’s dazzle, you’ll hardly notice it doubles as a sports watch, with a unidirectional turning bezel and water resistance to 300 meters. In terms of size, the watch fits comfortably, with a 27 mm case and 14 mm wide bracelet. 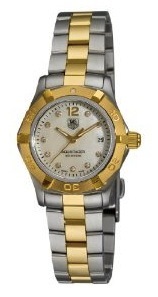 You won’t have to make the hard choice of wearing silver or gold accessories since this watch is dressed to match both. Whether you’re sporting jeans or a business suit, you’ll find this watch captures the spotlight. The design of the TAG Heuer Women’s Aquaracer Two Toned Diamond Watch WAF1425.BB0825 awards it a place in the foreground. The price tag will plummet as low as $1,679 if you shop online. Bottom Line: If you don’t mind a timepiece getting a lot of attention, then give this one some of yours.